What photo takes you right back to Chiang Mai? 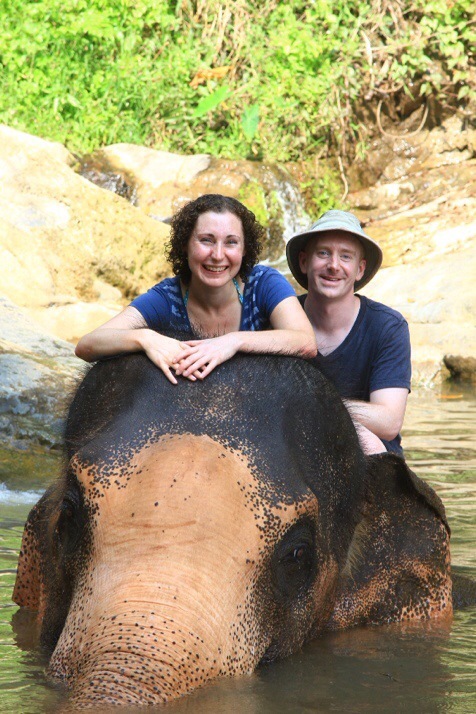 Our day as elephant owners was one of the most memorable of the trip so far. Summarise Chiang Mai in three words. Elephants – are everywhere; tour agencies offer experience days similar to the one we did, the commonest kind of beer is Chang (the word for elephant in Thai), souvenirs, T-shirts and other clothes are printed with elephants, and statues and shrines represent them. Wats – So many to visit in and around the city. Massage – is common across Thailand but there seems to be a particular concentration of shops in Chiang Mai and we got quite a taste for a regular pummelling. …you’re walking along the street and from one side the ladies of the massage shop call out “hello, massaaage?” while from the road tuk-tuks and songteeows slow down and beep at you as they pass to check if you need a lift. There’s no public transport in Chiang Mai so that function is fulfilled by vans called songteeows which operate as shared taxis, or tuk-tuks which work as private taxis. What one item should you definitely pack when going to Chiang Mai? Shoes which are easy to take off repeatedly for going into all the prayer halls of those wats. And if you visit during December and January a jumper would be a good idea as it gets quite chilly in the evening (don’t go mad though, there’s really no need for a coat!). This entry was posted in Places and tagged Chiang Mai, Round Up, Thailand on March 6, 2014 by Julie. What is 14 + 26 ?